L’Atelier des couleurs brings together the most stunning portraits from Femmes du monde in a color-in version, offering a new vision of the work of Titouan Lamazou. In a detailed introduction, Titouan Lamazou explains how he works, the many techniques that he uses, and shares precious tips with readers wishing to try their hand at the art of portraits. He then shares over thirty portraits to color in, taken from his work Femmes du monde whose tenth birthday we are celebrating this year, and the major exhibition devoted to it at the Musée de l’Homme in 2007. Each portrait is accompanied by a brief presentation of the model, a palette of suggested colors, and a clear-cut drawing allowing readers to reproduce the artist’s work. 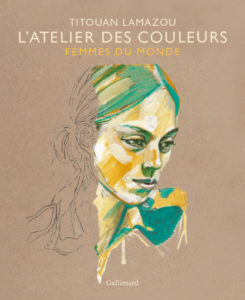 L’Atelier des couleurs is published as part of Gallimard’s Albums Hors-série Collection.